Bridge column, February 1: Should you start on spades or diamonds? Benjamin Franklin said, "I should have no objection to go over the same life from its beginning to the end: requesting only the advantage authors have, of correcting in a second edition the faults of the first." If we could play a bridge deal a second time, we should be able to correct any faults made the first time. And, of course, so could our opponents. However, we only get one shot at making the right play -- which is what in today's deal? South is in four spades. West leads a low heart. East wins with his ace and returns the heart queen. The auction was sensible and practical. 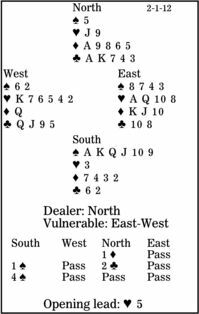 Yes, with four-card support for a five-card or longer suit, South might have steered his partnership toward diamonds; but with his six solid spades, it was unlikely a diamond contract would have been better. With those solid spades, South might be inclined to ruff the second heart and draw trumps. But he is then left with only one spade. When he turns to diamonds, East takes a trick in the suit and leads a heart, making South ruff with his final trump. East wins his second diamond trick and plays another heart to defeat the contract. When you have a side suit that needs to be established, it is usually right to start on that suit immediately. At trick three, South should play a diamond to dummy's ace, then lead another diamond. East wins but has no riposte. If he plays a heart, declarer throws a club from his hand, ruffs on the board, and plays another diamond. South ruffs the next heart, draws trumps, and claims.